Ornamental designs surrounding printed pages. The first ornaments for title-pages consisted of arabesque borders with white figures. They are found in books printed at Lisbon, 1489-92, the plates of which, together with Eliezer Toledano's types, were subsequently taken to Salonica, where they were used in the printing-establishment of Don Judah Gedaliah, who had previously worked in Lisbon. A border of flowers and animals, similar to the border used in many of the Naples prints, is found as early as the Ṭur Oraḥ Ḥayyim published at Leiria, 1495. The borders in some editions of the Soncino press are artistically executed, as are those produced by the Gersonides at Prague; those of the prayer-book, Prague, 1527, and of the Pentateuch, Prague, 1530, are remarkable for their beauty. On the top of the title-page of the Ṭur Oraḥ Ḥayyim, Prague, 1540, Moses is represented with the tablets of the Law; below are two lions, a crown over a city gate (the coat of arms of Prague), and to the right and left winged men with shields; in addition, a "David's shield" on the right side and a ewer on the left. The same design is found in the Prague editions of the seventeenth century. The style of printing current at Prague was taken as a model by the wandering printer Ḥayyim Schwarz in his editions made at Augsburg, 1533-43, and Heddernheim, 1546. Thus, the title-page of the Heddernheim Seliḥah is similar to the border of the Prague Haggadah of 1526; Adam and Eve suggest Dürer's female figures, but are not nearly so well modeled. The influence of this Haggadah may also be seen in some editions printed at Cracow by Halicz in 1534. The title-page of Isserlein's "Sha'are Dura" has a white arabesque border, and two angels with flute and drum at the top. Portals are most frequently used, being found on the first Bomberg editions at Venice, and occurring as late as the nineteenth century, sometimes with straight, sometimes with twisted, pillars. Hans Holbein, the younger, cut the title-border for Münster's Chaldean Lexicon, Basel, 1527, which resembles the border of the "Abḳat Rokel," Augsburg, 1540. The border to Boeschenstein's Hebrew grammar, Augsburg, 1514, was formerly erroneously ascribed to Dürer. The title-borders of the Midrash Tauḥuma (Verona, 1595) and of some of Foa's publications at Sabbionetta—for example, "Mirkebet ha-Mishneh"—deserve special mention among those produced in the sixteenth century. Some editions made at Amsterdam, Frankfort-on-the-Oder, and Prague during the seventeenth century have as an ornament on the title-page an eagle, on the wings of which Jacob's entry into Egypt and his meeting with Joseph are represented. The book "Bet Levi" and some others printed at Zolkiev in 1732 have a border surprisingly elaborate for that establishment. Sulzbach editions of the Maḥzor frequently have rich title-page ornaments. Moses and Aaron with two angels above them are seen in the editions of Zolkiev, 1764, and in many from Frankfort-on-the-Oder and Amsterdam. 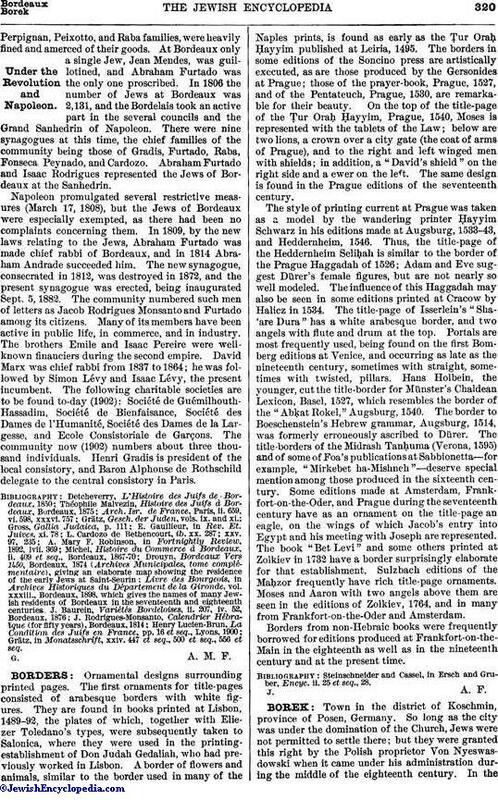 Borders from non-Hebraic books were frequently borrowed for editions produced at Frankfort-on-the-Main in the eighteenth as well as in the nineteenth century and at the present time. Steinschneider and Cassel, in Ersch and Gruber, Encyc. ii. 25 et seq., 28.